Today I have the pleasure of sharing an oh-so-charming accessory line I recently stumbled upon, MOJO SPA Style. While the line can be great for a bride looking for a bit of color to pair with her white or ivory, I think they’re perfect for jazzing up your bridesmaids with something quirky and fashionable. The ruffled chiffon flower bags? Adore them for gift totes for your ladies to use the day of to tote around all their stuff. The bib necklace? A fabulous way to dress up a simpler dress. The flower hair pieces? Wonderful for any dress, and great for a bridesmaid who wants a little extra oomph in her hairstyle. Drooling like I am? Check out their shop here. Images from MOJO SPA Style. LOVE everything! 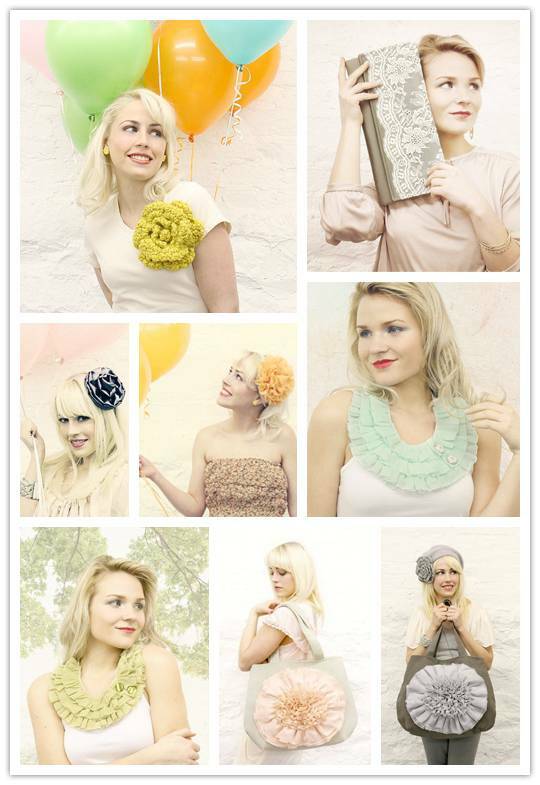 And their product photography – I think the image with the model and lace and taupe clutch is so CUTE! I love it all, especially the crochet pin in mustard! Thank you for sharing this great shop.